Well, it took a little longer than planned, but I have the splash screen, start screen, and the menus all visible in our WordPop overhaul. The screenshot is WordPop running on the new framework in a Windows Mobile 5.0 emulator. However, this prevented us from providing our two graphic menubar buttons that started a new game and toggled the sound muting. We happen to only have two menus, but this still didn’t fit our needs. So, I opted to override the softkey bar and continue to use the older-style menu bar. Furthermore, the way menus are described in the resources of the application had changed slightly to accommodate the new softkey bar. That meant changing how I described my menus to fit. All of this was poorly documented because they really want me to use the new look. It’s all there, now, though. I will continue on by hooking up the standard dialogs WordPop has (About Box, Purchase Info, Preferences, etc.). I would like to hear from you about my decision to stick with the older style. I’m sure Todd would like to hear your thoughts, as well. It’s always a balance between what we as the developers want to provide, what the customers expect, and what standard UI Microsoft would like for us to conform to. Let us know what you think. I’ve finally laid the groundwork for the WordPop update. I’ve built the skeleton on top of our proprietary framework. 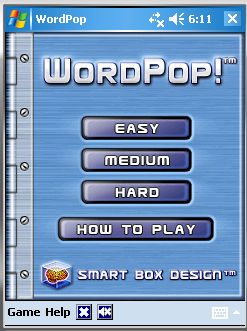 The original WordPop for PocketPC was based on an attempt we made to share a framework between the Palm and PPC versions which was a moderate success. In the end, though, we felt we’d get better performance with separate frameworks and I wrote a new one for Farkle which also got used on Word Monaco. WordPop now gets to join the club. I’ve been working on the prefs structure lately. The prefs for the original were done in a non-standard way for PPC devices and were susceptible to loss in certain reset situations. Since Farkle, I’ve been better about it and it’s time to fix WordPop. I will also have to write some code to read the old prefs and maintain the Best Words and High Scores after an update. I always feel like I’m corrupting clean code by including poorly written code just to support older versions (even when I’m the author of the ugly stuff, too!). But, even I would be annoyed if I lost the records of my best games, so it’s going in. Next up, placeholders for all of the different screens in WordPop.